Jamie Lee Curtis returns to her iconic role as Laurie Strode in the new Halloween movie, and her 1978 co-star Kyle Richards would have been just as happy to also reprise her role as Lindsey Wallace in the new sequel, and while she says that didn’t happen this time, Richards did recently get together with Curtis to reminisce about the landmark original Halloween 40 years later. Entertainment Tonight recently had Kyle Richards interview Jamie Lee Curtis about the original Halloween and this year’s direct sequel, which you can watch below. John Carpenter returns to the franchise he created 40 years ago as executive producer, along with Jason Blum of Blumhouse Productions and Malek Akkad of Trancas International, whose father, Mustapha Akkad, financed Carpenter’s 1978 masterpiece. Andi Matichak plays Allyson, Laurie Strode’s granddaughter in the new film, with Judy Greer as Laurie’s daughter Karen Strode, and of course Jamie Lee Curtis returning to once again reprise her role as Laurie Strode. Nick Castle reprises his role from Carpenter’s original 1978 Halloween to once again play The Shape along with James Jude Courtney as the new Michael Myers. The cast also includes Virginia “Ginny” Gardner as Vicky, Miles Robbins as Dave, , and Drew Scheid as Oscar, Dylan Arnold as Cameron Elam, along with Will Patton as Hawkins, Rhian Rees as Dana, and Omar J. Dorsey as Sheriff Barker. Inspired by Carpenter’s classic, filmmakers David Gordon Green and Danny McBride crafted a story that carves a new path from the events in the landmark 1978 film. The new film is directed by David Gordon Green from a screenplay by he, Danny McBride, and Jeff Fradley. Green and McBride are also executive producers under their Rough House Pictures banner, along with Akkad, Blum Carpenter, and Curtis. 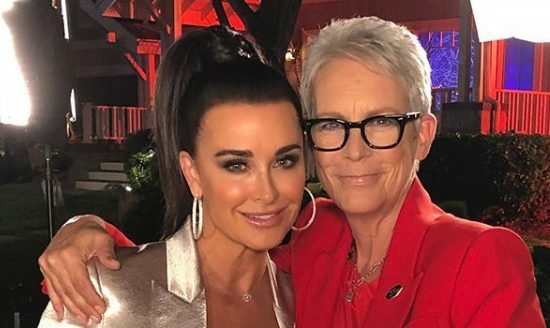 You can watch Kyle Richards interview Jamie Lee Curtis about Halloween below. See all of our Halloween 2018 coverage here!